Today 7 Aashad, 2074 [21 June, 2017], Teacher Service Commission [TSC] publishes the merit list of contract teachers of various subjects for all the developmental region of Lower Secondary Level. 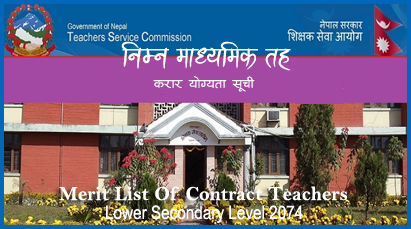 You can check and download the merit list of Lower Secondary Level Contract Teachers from the official web page of Teachers Service Commission [TSC]. 0 Response to "Merit List Of Contract Teachers | Lower Secondary Level | All Development Regions | TSC"